Russian President Boris Yeltsin oversaw the official end of the Cold War on Feb. 1, 1992 at a meeting with George Bush. 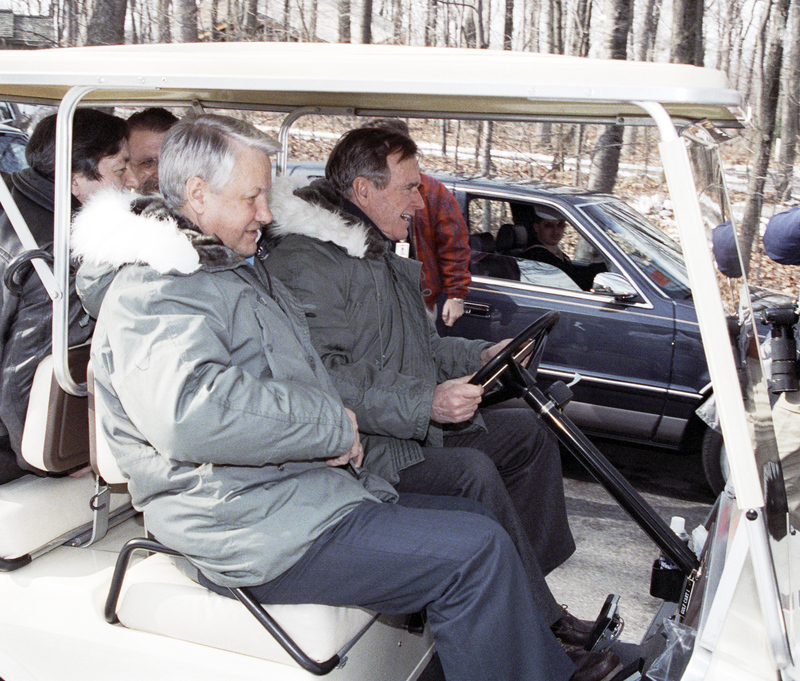 Photo: Russian President Boris Yeltsin (left) and U.S. President George Bush (right) at Camp David. A joint declaration, signed by Russia and the U.S. at Camp David on Feb. 1, 1992 officially ended the Cold War. What were its causes and how did it unfold? The Cold War, lasting from the end of World War II until the collapse of the Soviet Union, witnessed nearly half a century of antagonism between the USSR and the U.S., as well as their allies. Two years later the Bernard Baruch, an advisor to U.S. President Harry S. Truman, became the first to use the term in an official speech. By 1945 the conditions that had brought about the Cold War were already in place. By then the Soviet Union had established control over Eastern Europe, leading the UK and U.S. to view it as a threat. The Cold War was finally triggered by Winston Churchill’s March 1946 speech in Fulton. In that speech, he stressed that “the United States stands at this time at the pinnacle of world power,” while also commending the valor of the Russian people. However, he saw the growth of communist parties in European countries as dangerous. The ideological justification for the Cold War was outlined in 1947 in the Truman Doctrine, where the U.S. President argued that communism and capitalism were irreconcilable and the objective of the U.S. was to contain communism within the borders of the USSR. The U.S. then began to surround the USSR with a network of military bases. By 1948 the first bombers armed with atomic bombs targeted at the USSR were deployed in the UK and West Germany. At the same time, the Soviet Union was negotiating with Turkey for a naval base in the Black Sea Straits. In 1949 the Soviet Union tested its first atomic bomb, followed by the first U.S. test of a hydrogen bomb in 1952, where the atomic bomb is merely the catalyst for a blast many times the magnitude of a simple nuclear explosion. The Soviet Union was not far behind, however, and tested its own hydrogen bomb in 1953. Military spending grew and military alliances were created: NATO, the Warsaw Pact, ANZUS. The Cold War frontlines were not found at national borders, but within them. In France and Italy around a third of the population supported the communist party, but under pressure from the U.S. and conditions attached to the promise of aid for post-war reconstruction, communists were excluded from government. The pro-communist governments of Eastern Europe refused U.S. aid, cementing the division of Europe. In both camps dissidents were subject to repression: In the Soviet Union and Eastern Bloc countries people were arrested and sometimes shot on charges of cosmopolitanism; in the West undercover communist and agents of the USSR were exposed. In the 1960s, after the Cuban Missile Crisis, the two superpowers moved to a policy of gradual détente. They signed a number of treaties limiting the ongoing Arms Race. By 1979, however, the two countries were back on hostile terms. Soviet troops invaded Afghanistan and the U.S. imposed economic sanctions against the USSR. In 1983, U.S. President Reagan called the USSR an “evil empire” and put forward a proposal for the Strategic Defense Initiative – a missile defense system intended to protect the U.S. from nuclear attack. In 1985, Gorbachev came to power and announced wide-ranging reforms that included a provision for the improvement of relations with capitalist countries. Following the talks, a joint declaration was signed by Russia and the U.S., stressing that “Russia and the United States do not view each other as potential opponents” and intend to build a relationship rooted in friendship, partnership and mutual understanding. The declaration also stated that the two countries would make an effort to eliminate any remnants of hostility from the Cold War, to ensure the spread of common values, and to limit the proliferation of weapons of mass destruction as well as conventional advanced weapons systems.